"MARBLING BROWNIE BATTER: To produce a marbled effect with two different-colored batters, pull and swirl a kitchen knife through the batters." 1) Preheat oven to 350F. Grease 13" by 9" baking pan. In small bowl, with wire whisk, mix flour, baking powder, and salt. 2) In heavy 4-quart saucepan, melt butter and unsweetened and semisweet chocolates over low heat, stirring, until smooth. Remove from heat. With wooden spoon, beat in 1 1/2 cups sugar. Stir in 4 eggs and 2 teaspoons vanilla; beat until well blended. Stir in flour mixture just until blended. 3) In small bowl, with mixer at medium speed, beat cream cheese until smooth; gradually beat in remaining 1/2 cup sugar. Beat in remaining 1 egg, almond extract, and remaining 1/2 teaspoon vanilla just until blended. 4) Spread 1 1/2 cups chocolate batter in prepared pan. Spoon cream cheese mixture in 6 large dollops on top of chocolate mixture. Spoon remaining chocolate batter over and between cream cheese in 6 large dollops. With tip of knife, cut and twist through mixtures to create marbled effect. 5) Bake until toothpick inserted in center comes out almost clean, 35 to 40 minutes. Cool completely in pan on wire rack. Gosh these are killing me, because I want one now! I have seen a similar brownie and keep thinking I would make something, but now this is going to stick in my head, a total YUM! You have to try it!!! I had seen these before in other cookbooks, but I finally found a simple recipe that ended up being fabulous! Yummy, yummy, yummy!!! 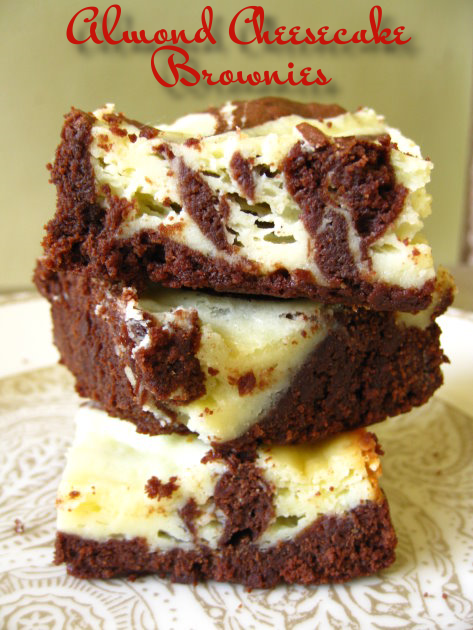 I've always wanted to have a cheesecake brownie, but with almonds it sounds even better! Right???? It's something about this recipe featuring almond extract that makes it even more mouth-watering!